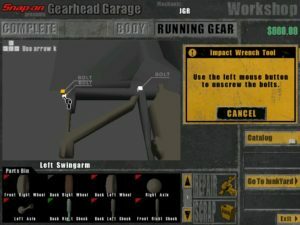 “Car mechanic simulator” is the game I didn’t even realize I wanted until I found out it existed. My knowledge of automotive maintenance doesn’t pass beyond “turn key and if it doesn’t start, call someone who knows what they’re doing,” but I’m not one to pass down an interactive opportunity to learn a bit about a new field. If you too think you might enjoy the potential puzzles of breaking down an engine and seeking out the defect, well, there might not be as much going on here as you would expect, but what is here is pretty fun. Gearhead Garage has you cranking out jobs that raise your profile’s rating from novice to expert. Gameplay is very straightforward. You’ll click a button to get a job from what appears to be a static list – you’ll progress from “easy” to “expert” jobs within each rating. A cartoonish client will give you a description of the issue, ranging from generic “noises in the back,” to requests to upgrade the vehicle with turbochargers or a new drive system. Each job has a budget, and you’ll need to fall within that range to complete it. Proper management of parts lets you eek out a higher profit from each job. With job accepted, you’re presented with a 3D polygon model of the vehicle in question. Tabs above the view window let you focus on the body, the engine, or the suspension/chassis. Visibly damaged parts have no textures. Disappointingly, there’s no deformation tech here to show crumpled hoods or dented bumpers, and the worst damage is a part that’s completely missing. You can also hold down a “condition” button to see a color-coded x-ray view of the car. Damaged parts appear as red or yellow, and you can rotate the model to bring them into view. Parts are instantly removed simply by clicking on them, where they are moved to the parts bin at the bottom of the screen. 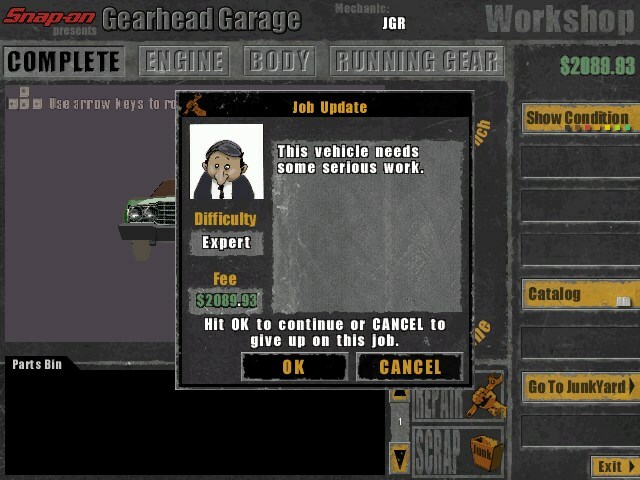 You rarely need to remove parts in order, but when you do, the game will notify you (such as removing windscreens before pulling off the roof). 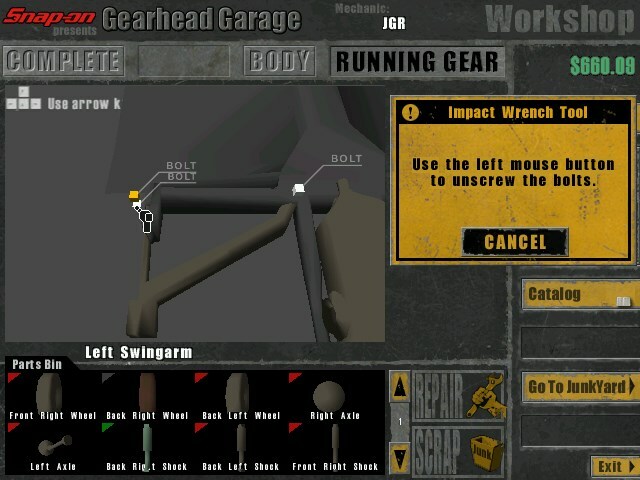 At the engine and chassis levels, you’ll be asked to click on any connecting bolts before you can pull the part. These are helpfully marked and appear as white cubes – again, simply click on each bolt and the piece comes off. Reassembly is just as simple. Drag parts up from the bin and they’ll snap right into place, asking you to reattach any bolts if applicable. Each bolt gives a satisfying “zzzip” of the impact wrench. Parts in your bin keep the same red/yellow/green color code. Green parts are ready to go, while yellow and red parts must be dragged to a “repair” button. A dialogue appears displaying the cost to repair the part, which comes out of the current job’s budget. Accept, and the part is now fully green. The occasional part may appear gray, meaning it must be replaced entirely. For this, you head to the catalog or the junkyard. The catalog always has the part you need, but will always charge the maximum price. The junkyard has a random selection of applicable parts per job, and may have the one you need in a random condition. 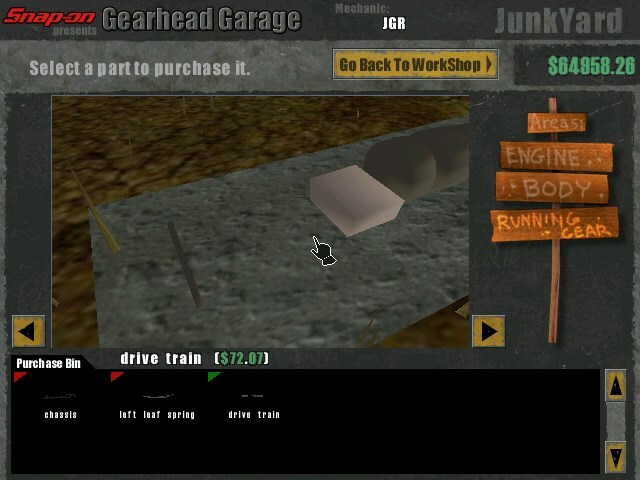 Even still, it’s always cheaper to buy from the junkyard and repair than to purchase from the catalog. Also, any parts you saved from a previous job can be used if a car of the same model comes through again, saving more money. When the car is complete (a helpful “assembled” tag appears for each tab) and meets the job requirements, the task automatically finishes and you walk away with the remaining profit. This cash goes into a personal fund that essentially acts as your high score. You can never use your bankroll on a client job, and there’s nothing you can buy in terms of tool upgrades or new garages. Your only option is a side business of refurbishing cars for resale, or to place in your own collection. An “auction” tab lets you bid against random cars in an extreme variety of conditions. If you outbid everyone else, the car gets added to your lot. You can view it at any time, and bring it into the garage between jobs to add or upgrade parts. That’s the whole game. While certainly accessible, it’s also disappointingly simple. Your magic air wrench means disassembly of an entire car takes seconds, and only attaching/reattaching bolts slows you down. Simply dragging parts to instantly repair them to perfect condition seems to waste the opportunity for some good minigames, as well as some strategic decisions – e.g. there’s no option to take a chance and reattach a lower quality part, because the job won’t complete until all parts are green. You’re also able to repair anything that isn’t randomly marked gray, including things like air filters and severely damaged windshields that you would think you’d have to buy new. The junkyard probably has what you need, and at a lower cost with no consequences. Because of this, there’s no challenge involved. “Expert” level jobs only mean you’ll be doing more clicking. I’m torn, because while I appreciate that no mechanical knowledge is required, none is rewarded either. There are jobs that require you to build a entire engine from scratch, but these are as simple as consulting the catalog to make sure you’re not missing any parts. Once you have everything, you throw the pieces individually from the bin where they snap and hover right into place. You’re done in seconds without learning a single thing about what a distributor is, or why a crankshaft interacts with a flywheel. Further, it seems impossible to fail a job. I intentionally bought and sold parts repeatedly until I blew through the job’s budget, and even then, didn’t get a notification that I screwed up. You just quit the job with no repercussion. You can buy cars at auction in the worst shape imaginable, but you’ll always make a profit on the restoration when you sell it. There’s a secret difficulty level when you reach $125k, but that just unlocks F1 racers and dune buggies – it’s still the same gameplay as always. And as said, there’s no other management aspects of your garage or staff, so you truly just mess around with the various cars until you get bored. Graphically, there’s nothing to complain about. The interface is clean and efficient. Models rotate without a single hitch on a modern system, and zoom automatically when needed to fuss with bolts. Cars look great, and I love that you have the option to repaint the stock Gearhead cars in a free mode, per part, or apply decals. There are both software or DX7 hardware rendering modes, with hardware giving much sharper models and true transparencies. Software rendering is functional (and far more compatibility-friendly), but hardware’s improvements are worth the trouble you will certainly go through. No audio except for a fairly goofy opening theme, and various effects when using your wrench or selling a part. A Dodge Viper from the community. Just the shell, with no engine modeled. As shipped, Gearhead comes with a reasonable supply of unlicensed, legally generic car models. The community stepped up to offer new models that slot seamlessly into the game. The developers also released an update that adds an infinite job randomizer, which also pulls from the roster of user cars when applicable, meaning you can truly stay at this for as long as you like. The community models replicate real world cars with varying degrees of skill – one of my favorites was the 1955 Lincoln Futura with the option to mod it into the ’60s TV Batmobile. Others have engines far more detailed than Gearhead’s stock ones, down to pistons and radiator hoses. On the other end of the spectrum, you have quite a few that don’t model anything beyond the outer shell, and rare is the custom car you’re able to repaint, or that bothers with any bolts. 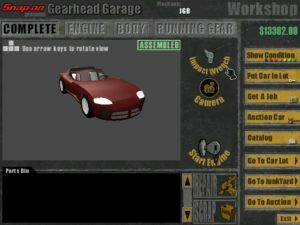 I guess there’s just something fundamentally fun about tinkering with cars, because Gearhead is more enjoyable than its simplified mechanics should be. 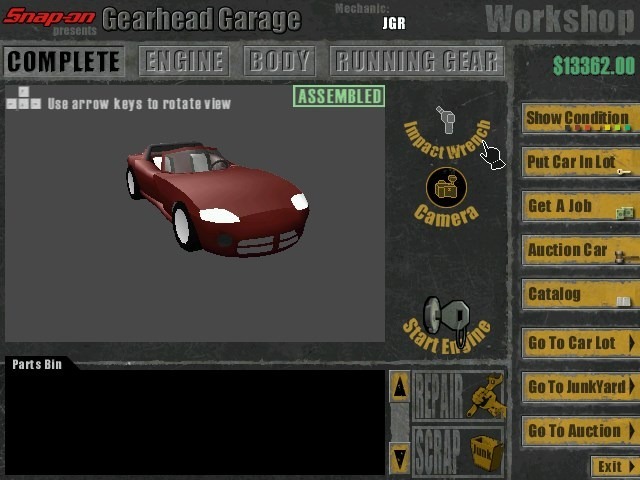 This is more of a virtual model builder than a true car customizer, and you will never be able to tune or drive your rides as in the Amiga’s Street Rod. Still, the simplicity lets you bang out jobs before any single one of them gets boring, and the ability to build up a shiny fleet of the game’s finest rides elicits at least a small amount of showroom pride. 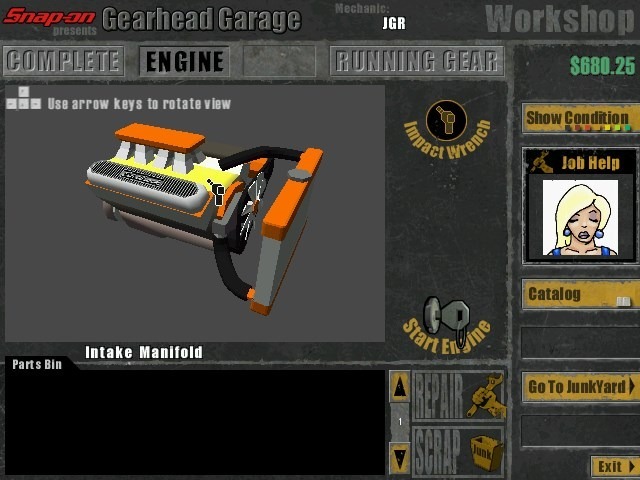 Gearhead’s a staple of a virtually non-existent genre, and a fun go at being a virtual greasemonkey. Simple and accessible. You’ll never need to hunt around an engine bay for a part, or know what any names are. Community additions expand the roster to a full fleet of dream cars you can fix up and store in your lot. Gameplay’s just a little too basic – find the damaged parts, instantly pull them, instantly repair them, instantly snap them back on. No extra modes or options beyond fixing up cars from auction. You don’t need the knowledge, but then with a big, red, “IT’S THIS ONE, DUMMY” view it becomes so easy you quickly lose interest. I’ll admit it’s a tough, maybe impossible balancing act. There’s a quasi-remake on Steam right now called Car Mechanic Simulator 2014 that has the same problem. This game though is pretty fun replacing the bad with used parts laying around or at some junk yard. I did show this to my dad and he laughed at me (Auto mechanic that he is)… I went and cried in the dark till I found another game to mess with. Which of course didn’t take long..